Day two’s prompt in The Blurt Foundation’s Self Careathon is Obstacles. I wrote this poem on a night when I was ambushed by obstacles of social anxiety and self-doubt. Writing it helped me a lot. I hope reading it helps you too! an open field. beautiful. endless. eyes closed, you lie down on the soft grass, letting your mind soar. you allow your brain to feel every feeling it can, unapologetically. and suddenly, the world stops. just for that moment. My wise and beautiful mum told me that the life we live is very short and very precious. Life is truly a blessing and we simply must not let it slip away. My mother was essentially just telling me that you only live once, and you have got to make it count. Which is why self-care is so important! A method of self-care that I tend to be a little scared of is externalizing my problems. The funny thing is, that I realized that these problems were problems only because I was not externalizing them! I have recently vowed to try and link the things that I worry about to real life facts, relationships, and situations. I started focussing on getting my anxieties out of my head and into the real world, either by talking to someone about them or writing them down. And the whirlpool of the overwhelming and overbearing confusion started to die down almost immediately. Once they were out in the real world, I found it much easier to reason them out— ‘why did these things make me anxious?’, ‘how could I work on those anxieties?’, and ‘how could I positively approach the things that gave me this anxiety?’. This was my new magical formula for therapeutic self-care. Sitting down to process my feelings and self-destructive thought patterns helped a lot. Though the sound of it sounds a little uncool and boring, externalizing your problems and having a good understanding of your emotional well-being is just as cool as sipping on margaritas and partying! That is certified information that I am sincerely conveying to you from the terms and conditions of the treat-yo-self department. Does that make sense? I guess, I just want to say that I am trying to live a little less in my head, and a little more in this crazy beautiful world around me. And I am doing that through The Blurt Foundation’s SELF CAREATHON! I was inspired by the amazing Carrie Hope Fletcher to do this! Click here to find the prompts. 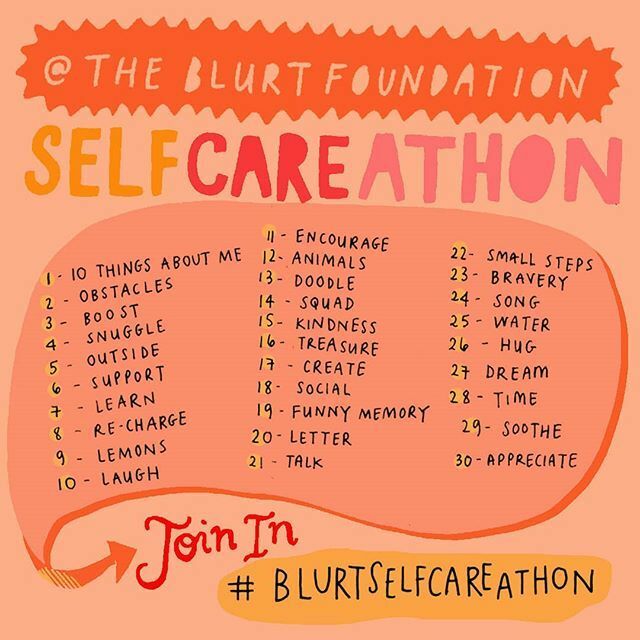 Use the hashtag #BlurtSelfCareathon if you would like to join in, or just think/communicate/do a mind exercise using the prompts! i fumble, I don’t like talking about myself, and that’s only because I am terrible at it. Both talking, and conveying to someone why I might be a remotely interesting human. i fear, and I used to let my fears define me. Now, I try my best to accept them as a part of me and something that I can work on to build better friendships and learning experiences. i do a lot of math! Math rocks! i create, be it daydreams in my head, crafty DIY projects, the magic of poetry, code that does things I didn’t think would be possible. i have leadership anxiety? I do not work too well when I have to lead big things and be ‘in-charge’ of a team. Even if I do end up working okay, I do not enjoy the process. But, I do well when I’m in charge of working on small projects that allow creative freedom with other people instead of them working under my leadership. i cannot remember, your birthday, due dates, plots of movies I’ve watched, some inside jokes or much of anything. My memory is not reliable. I always write things down and make reminders to keep my life from falling apart. I also always write down good memories so that I can revisit them. i plan! I love my planner and giving my day a concrete structure than I can do a fun little dance of productivity on gives me happiness. i love me, i love me not. I love myself, but I am also ironically very self-critical. i heart my family. My family is small, but they are my world. I used to imagine myself living as a black silhouette against a vast blue backdrop. Unfortunately, it wasn’t the kind of blue you’d see in the sky. It was sad and dull and was a color that would come in a paint can labeled ‘Melancholy Blue’, which I voluntarily let someone spill all over my walls. Every inch of the space around me engulfed me in the blues of my worries and anxieties. Sometime later, I started to paint my walls in black. To me, a black backdrop felt like the greatest idea because it would camouflage my fears, my flaws, and my failures into an expanse of nothingness. And honestly, it did a great job at hiding them. Not even half done with listing everything that I thought was wrong with me, I realized that I was finished with all the painting already. I was now surrounded by a totally dark backdrop which would keep everyone oblivious to my flaws and everything wrong with me. However, taking a step back, it dawned on me that in an attempt at hiding my flaws from the world, I had blended myself into my insecurities, making myself and my identity invisible to the world. In the middle of a sudden surge of panic of how my plan had backfired, I remembered the one and only flaw I had that was strangely more self-reflective than self-destructive. It was just one but I believed it was truly powerful. This flaw of mine was how I always wished to stay on familiar, comfortable grounds where I felt most powerful, capable and sure of myself. To my surprise, I felt most comfortable when I was with myself. Now, it seemed a little odd to me that if I enjoyed being with myself so much, I could possibly enjoy being myself too. This little ray of hope that I had, suddenly illuminated my way out of the pitch darkness. I went out into the world, found myself some white color instead, and painted it over every bit of the darkness in my past. It was a revelation to me how free my mind felt in this new white space, that seemed infinite, and was truly accepting of every one of my shortcomings and proud of my little victories. It was an open canvas just for me to paint in rainbow colors of accepting my flaws. This discovery reminded me that self-love wasn’t just black or white. Self-love was a spectrum of hardships, failing, falling, feeling strongly about giving up, just before turning everything around, and coming back stronger and braver than ever before. I doodled on a little orange Band-Aid of healing, and happy green leaves of growing right next to the colorful rainbow to remind myself that when I was not growing, I was healing, and that maybe growing and healing were the same thing in a beautiful way. Effortlessly, a few shades of colors taught me to reinvent how I thought of happiness. I now knew that I should never feel like I am entitled to being sad. Neither should I try to hopelessly hide all my flaws or let them define me. I learned to accept my flaws, to open myself up to taking on challenges, and to be kind to myself. All thanks to a little bit of paint and self-love.